A few days ago I published a post about an interesting Easter fact in Belgium. The article referred to flying Easter Clocks, and I remember whilst writing the post, I hesitated a few times whether I needed to use the word clock or use the word bell. It looks like it is a case of lost in translation! Just to elaborate, in case you didn’t read the article, in Belgium it is the bells that hang in the clock tower of a church that carry the Easter Eggs they picked up in Rome and then drop them in Belgium. It was one of my Belgian friends on Facebook that asked me if I meant to write bells instead of clocks . I checked the word of Clocktower ( a tower that has clocks and bells. He came back with the word belltower, ie a tower that has bells, but no clocks. I then realized I made a mistake. Now why would I use the word clock instead of bell? 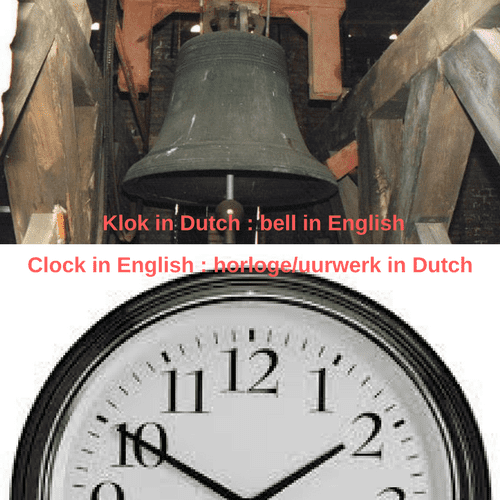 To translate the word clock into Dutch, it’s horloge or uurwerk ( hourwork being a very literal translation), To translate the English word bell into Dutch is…. klok. (It’s not entirely consistent, as a doorbell is not called a deurklok, it is called a deurbel. So it looks like we have a great example of a homonym, meaning a word that sounds the same, but have a very different meaning. Easter Bunny brings eggs, or is it the flying Easter bells? Below image shows you how the bells get wings, so they can fly to Rome and back.